If you believe the calendar, spring has officially arrived in the Northern Hemisphere. Hurray! Unfortunately, the weather hasn’t quite gotten the message. This means I’m dreaming more of spring than actually experiencing it. Still, the sun is higher in the sky and the willow trees are beginning to turn green – events promising that Nature and the calendar will eventually get on the same train. Then, the rejoicing will truly begin around here. I’ve found all kinds of inspiration this month. Some is directly related to the season: Easter, spring cleaning, and my birthday. Some of the links just caught my fancy in one way or another and I thought they might do the same for you. The perfect perspective of home. Speaking of home, springtime often means spring cleaning. Some ideas for tackling the job. Listening to audiobooks while cleaning the house? I never have, but think it’s a lovely idea. Here are some great suggestions. I’ve been wanting to read The Buried Giant and The Goldfinch. Maybe I’ll listen to them instead. Cleaning is not really my favorite sport. These cleaners might tempt me to do it more often simply because they would smell so good! After the house is clean, it’ll probably be time for an Easter Brunch. This also belongs on the menu. Actually, it could be the menu and I’d be happy. Of course, there must be flowers on the Easter brunch table. Or any time, really. More flowers. And way more creativity. And speaking of creativity, just give me one small corner of this space and I could create whimsical creatures, too! I’ll be celebrating my 46th birthday in a few days. This interview came at just the right time. Did you know that a fully illustrated Harry Potter and the Sorcerer’s Stone is in the works? It looks perfectly wonderful. I’m heading to Scotland this summer. Steven Carter is whipping my anticipation into a frenzy. I. Can. Not. Wait. Finally, I’ve been finding Hillsong’s The Creed to be especially inspirational coming into this Easter season. I’m feeling very inspired. I think I’ll head to the grocery store and collect some more flowers. 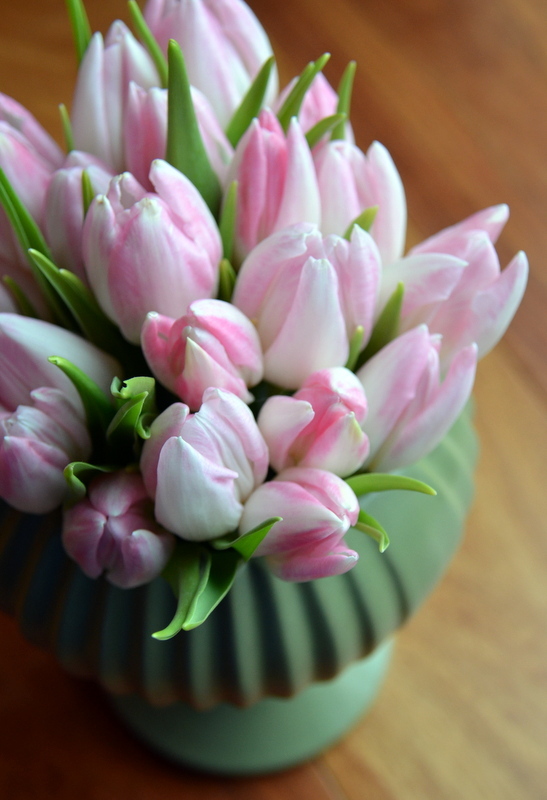 Even if it’s not quite feeling like spring outside, there’s no harm in making it look like spring inside.